Every year, PM360 showcases some of the best creative work from agencies serving the life sciences industry from the past year. The Greatest Creators Showcase of agency work done for the industry celebrates only 15 selections of the best submissions in 2018. Each agency explains the creative process behind their campaign and lists the people responsible for working on it. This year, Elevate Healthcare and their client, DePuy Synthes Trauma were honored for the creative campaign developed for the new DePuy Synthes TFNA Augmentation System. 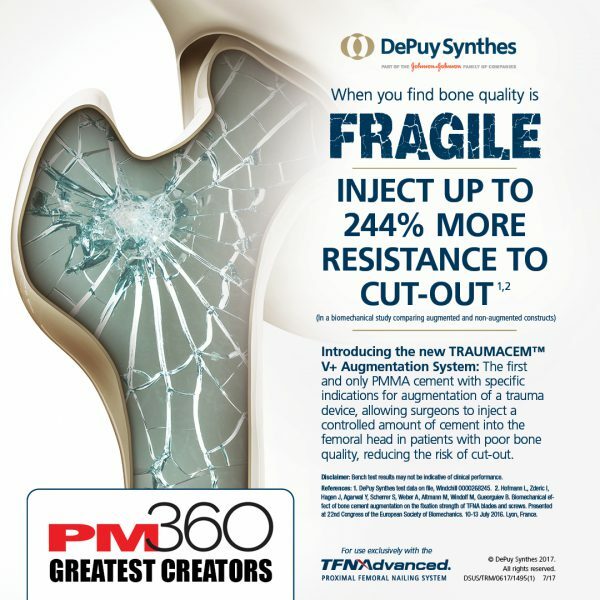 The “Bad to the Bone” campaign was created for the launch of the new DePuy Synthes TFNA Augmentation System, the first and only polymethylmethacrylate (PMMA) cement with specific trauma device indications for use with the TFNA System. The TFNA Augmentation System is used to address the needs of patients with hip fractures and who have poor or osteoporotic bone quality. These fractures are common in the elderly and often lead to increased morbidity and mortality. The TFNA Augmentation System allows surgeons to inject PMMA into the implant, even during a procedure, to enhance bone fixation and prevent what surgeons refer to as cut-out—a loss of implant anchorage or stability in the bone, frequently occurring in those with poor bone quality. Cut-out causes the femoral neck-shaft angle to collapse, and is a leading clinical complication during hip fracture surgery. Learn more about the Greatest Creators and visit all the winners at PM360.